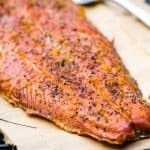 Traeger Grilled Lemon Dill Salmon is a bright and wonderful way to grill fresh salmon! 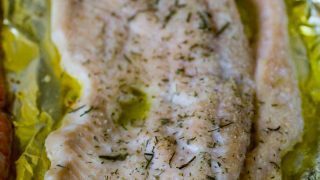 I love how the dill and lemon really bring out the fresh flavors of the fish, plus it is SO easy. 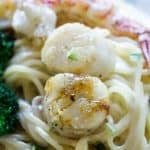 Seafood is one of my all-time favorite foods. You know what I like even better than that? When my husband takes his boat out and catches me some fresh salmon! There is very little better than fresh fish, and when it can go from the ocean to your grill inside of one day? That’s winning. I can’t wait for you all to try my Traeger Grilled Lemon Dill Salmon. All the flavors of summer right in one little dish. If you are looking for a meal to impress, this is one for you. Salmon is one of those types of fish that people get a little intimidated by, but let me reassure you, this is easy. And fabulous. WHEN IS SALMON IN SEASON? Out here in the amazing Pacific Northwest salmon is best in July and August, so we have been spoiled rotten by my husband this year. He was out and brought us home quite a few of these flavorful fish. There has even been enough to share with the family. Salmon have a lifespan of three to eight years. They are considered a super fish. Why so super? They can live in fresh water and salt water. Grown salmon that make it to the ocean and are not caught by fishermen make their way from the ocean to the upper rivers. They then spawn and after spawning, they die. Then the whole cycle starts again. They call this the Salmon Run. WHAT HEALTH BENEFITS DOES SALMON GIVE YOU? Salmon is rich in Omega-3 fatty acids. This can help reduce certain risk factors in diseases, reduce inflammation and lower blood pressure. Winning. Salmon is a great source of protein. Protein helps you heal and is an amazing brain food. Salmon is full of antioxidants. This will aid in your brain, heart, and skin health. After listing just a few of these health benefits from salmon, you can see just how good it is for you. 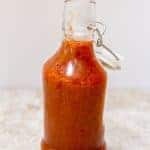 It can aid in weight loss, it can help prevent heart disease and certainly can help with inflammation. You can do more research on the health benefits of Salmon on our own. You will find many more on a quick internet search. 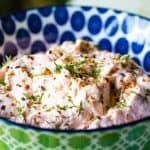 WHAT CAN I SERVE WITH SALMON? One of the best side dishes that like to serve with fish is rice. My Instant Pot Wild Rice will definitely do the trick. 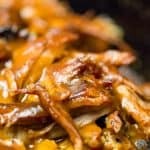 If you are more of a white rice kind of person, you will love my Pressure cooker | Instant Pot Basmati Rice. They are both foolproof and so delicious! My Grilled Vegetable Pasta Salad would be perfect with this meal. 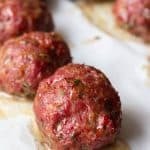 Want to make it a low carb meal? Try it with my Perfect Grilled Asparagus and no carb. You will be satisfied. Now, about that recipe. Let’s do it. 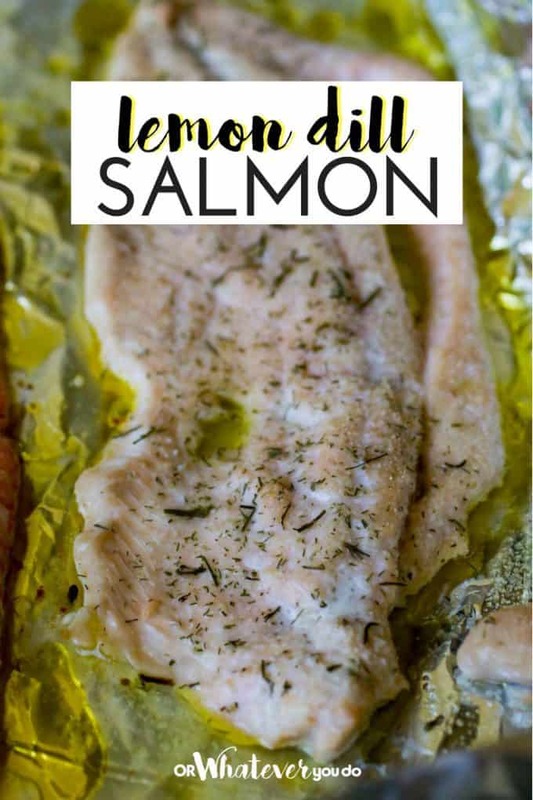 This easy lemon dill salmon is Traeger grilled and spectacular. 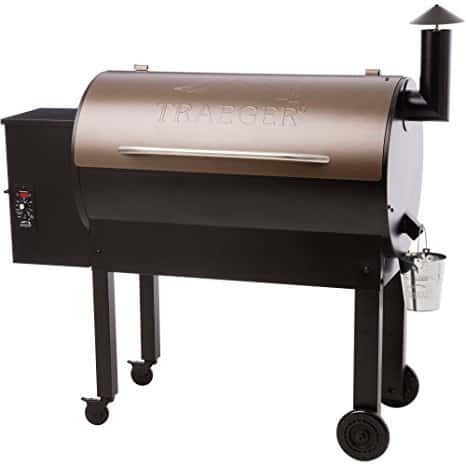 Fire up your Traeger by turning it to the smoke setting to get a fire established, leaving the ild open. This usually takes about 5 minutes. You'll see some smoke after a few minutes and then you won't see smoke anymore but the temp will stay steady(ish). Once the fire is established, turn the grill up to 350, close the lid, and let it preheat. 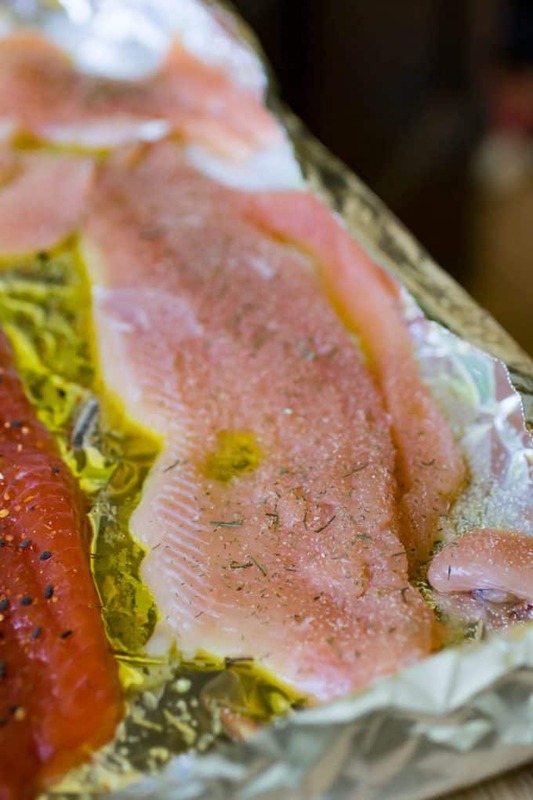 While your grill is heating, take your salmon filet and place it on a sheet of non-stick foil, skin down. Drizzle olive oil over it, and follow up with the salt, dill, and lemon. Just a squeeze over the top will do! 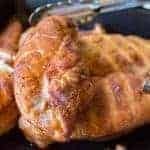 Once the grill is preheated, place the foil with the salmon on it onto your grill grates, shut the lid, and let cook for 15-20 minutes. Depending on how thick your filet is, you may need a little more time. 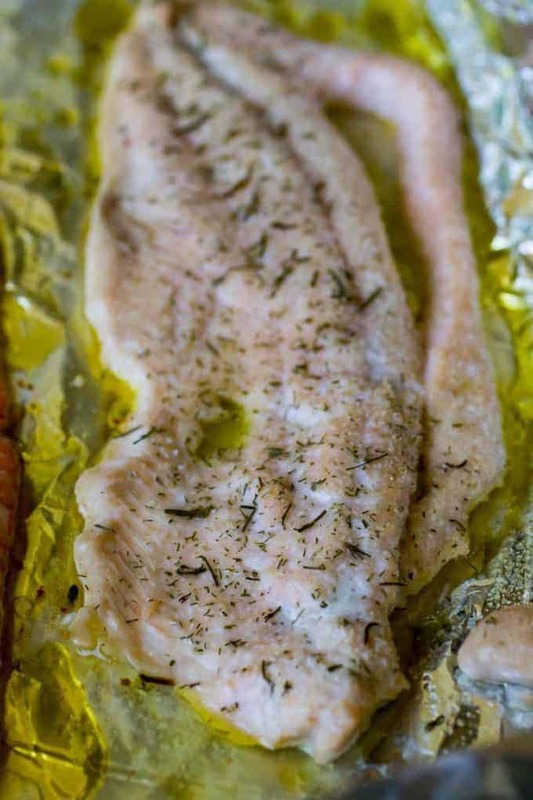 Make sure the fish is flaky, but also that you don't overcook it. 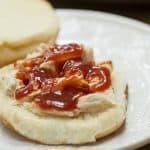 Remove from the grill when done, let sit 5 minutes, and serve!